It might seem easy to call the '76 Panthers a one-man team (that man being Tony Dorsett, he of the 1,948 yards rushing and Heisman, Maxwell, and Walter Camp awards), but a closer look reveals a team that was truly badass. 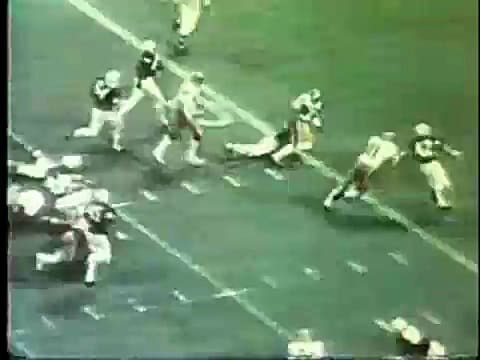 Starting with a 31-10 whupping of Notre Dame in South Bend (in which TD broke off for 61 yards on his first run on his way to 181 on the day), Pitt ran off 12 consecutive victories, allowing only one opponent to score more than 20 points (Duke, of all teams), and putting up 23 on all but one (Temple, of all teams, against whom the Panthers notched only three touchdowns). They capped the season with a 27-3 manhandling of no. 5 Georgia in the Sugar Bowl, with Dorsett going for 202.